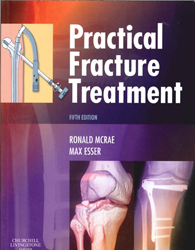 Practical Fracture Treatment - ubiq bookshop: the best place to buy books! The 5th edition of this now classic text draws on the strength of previous editions and now includes reference to the latest surgical techniques available in Europe, Australia and the USA. Emphasis remains on the continually expanding use of fixation techniques although conservative treatment options remain an integral part of the text. The artwork programme which so characterises the appeal and success of previous editions - has been fully updated although its clarity remains as strong as ever and the logical sequence of illustrations with their succinct captions affords a rewarding and effective way to learn. Suitable for medical students, junior doctors, orthopaedic trainees, A&E staff, physiotherapists and the rehabilitation team - this book should form part of the essential library of any healthcare professional involved with the management and care of fracture patients. Featured in the June 2008 Mostly Medical newsletter.